This photograph was taken at Belton house in Grantham, UK in April, 2008. It was early in the day and the doors to the house were not yet open to the public. I took this picture from the outside looking in through the window - at the time I didn't see anything strange, it was bright outside and I couldn't see much so I just put my camera up to the window and clicked. 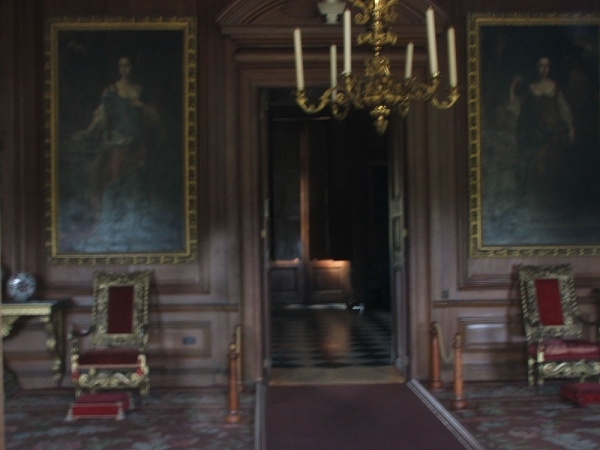 When looking through our snaps, my friend pointed out this picture which looked like a cowled figure standing near the doorway of the withdrawing room. I saw it pretty much straight away and I must admit - my hairs did prickle. What looks to be a smallish oriental looking figure stands to the right of the door. As this picture was taken through glass - it could easily be a reflection of some sort - as the human eye has an uncanny knack of finding patterns and faces in random marks - whatever it is - it freaked me for a while. I can't see a ghost or even shadow anywhere in this picture! I must be looking in the wrong place. Where is it? I can see 2 ghosts. This looks cool. I am not scared of ghosts, because my grandma's house had one, which I saw when I was 7. There is a woman there, at the window through the door, you can see her hair really clearly. There is also a man in a white coat with a beard. This is an awesome pic, though. WOW, that looks real. its so cool! It's one of the Earls in the house. I saw him too when I was there. He wears a white shirt tie n a brown tweed jacket his painting is hung in 1 of the drawing rooms. I saw him standing by the fire place in the piano room. I can see 2. There looks like a girl at the end near the window with her back to the camera. (Left from the obvious one and down the hall) Look carefully can anyone else see this?? Ok sooooooo why exactly is this called "the chinaman"? I take it you mean a chinese man? I don't see a chinese ghost. I see something looking ghost like, but nothing definitive for me to say "oh wow a chinese man is haunting an English manor". i copied and pasted this onto photoshop to lighten it to see when i could find, and there is clearly a figure there. his entire body is shades lighter than the rest of the room. this is a great shot! Oh my gosh that's really scary how old is it? It almost appears to be two of them. One to the left side of the door, very distinct. And one on the inside, (in the hallway) looks like a girl with long black hair. That one could very much be a smudge. It is difficult for me to see detail from the china man, looks like a typical ghost fiqure with white sheet and two holes cut out. hehe.... Excellent picture though, if I snapped that one. I'd be freaked out. It was okay nothing really that scary!! This man in the pic looks like a man whho is melting!!! This is a sick pic!!! Another great example of Paint.net and Adobe! Very nicely done, though. Cool. I did not see it at first. There's definitely a figure standing by the left side of the door facing the camera. Can't see enough detail to determine any features or costume but it's looking directly at the camera. That was one of the most scariest things I've ever seen.Good luck with the haunted house. This is a very intriguing image. I have heard of several haunting experiences at Belton but this photo is quite compelling. I'd be interested to hear what other people think.